one of the top Rock Cover Bands in america. THE TRIP is a high energy, genuine cover rock band that takes you on a fun-filled musical journey through the 60's, 70's, 80's, and 90's … as well as today’s Top 40 and rock hits. We’re one of the most popular booked wedding and corporate event bands in California. We perform at corporate events, concerts, weddings and private parties. We've performed at events for Microsoft, Disney, Lucasfilm, IBM, Sony Pictures, Budweiser, and for Toby Keith and Michael Anthony. PRESS RELEASE – THE TRIP of Laguna Beach, Ca has been recognized by GigMasters.com as a ‘Best Performer of 2017’! GigMasters, founded in 1997, is among the internet’s very first transactional marketplaces and where party planners and party entertainers alike come together to broker a booking. THE TRIP has won the GigMasters prestigious ‘Best Of’ award by securing 4 or more Verified Reviews of 4 stars or higher on GigMasters’ site. A GigMasters member may only receive a review from clients who are verified to have booked and paid them through the GigMasters platform. Their excellence has been recognized by their happy clients and the whole GigMasters community. THE TRIP will be the rockin house band backing up these great artists and celebrities on May 14. Hosted by Finn Wolfhard, star of Netflix smash, “Stranger Things,”featuring: Tenacious D, “Weird Al” Yankovic, Sarah Silverman, plus members of: Velvet Revolver, Taking Back Sunday, Steel Panther, Ok Go, Goldfinger, Sugarcult, Filter, Stephen Christian of Anberlin, Corey Taylor of Slipknot, Jane Wiedlin of The Go-Go’s, Deap Vally and more, covering the anthems of the 80’s! THE TRIP – AWARDED GIGMASTERS.COM OUTSTANDING BAND FOR 2016! PRESS RELEASE – THE TRIP of Laguna Beach, Ca has been recognized by GigMasters.com as a ‘Best Performer of 2016’! GigMasters, founded in 1997, is among the internet’s very first transactional marketplaces and where party planners and party entertainers alike come together to broker a booking. ‘An amazing performance!’ THE TRIP rocks the Dana Point Yacht Club for New Years Eve bash!! ‘You guys were great! 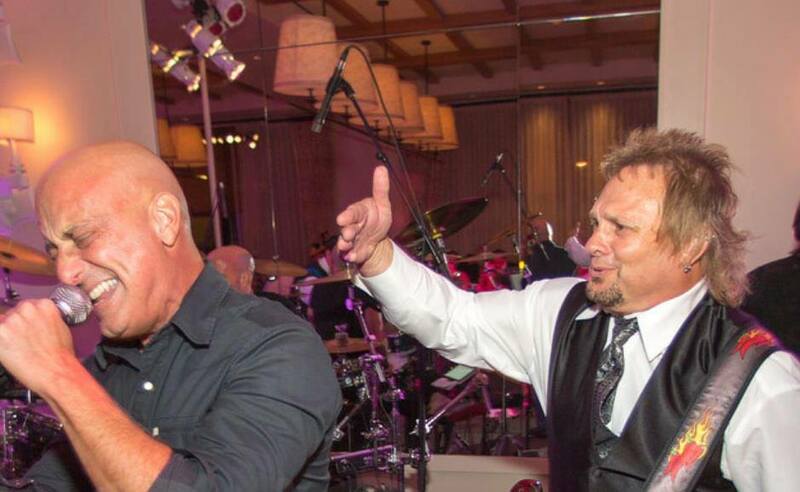 Awesome band!’ – Michael Anthony after The Trip rocked his daughter Elisha’s wedding! The Trip was hired for his daughter’s wedding, and the rock legend joined them onstage for an unforgettable rocking wedding reception for Billy and Elisha.